Posterior meningeal artery arising from suboccipital portion of the vertebral artery. The vessel enters the cranium thru foramen mangum and ascends along the lateral aspect of the occipital bone (red arrows). A sigmoid sinus branch, which actually runs in the dural sheath making up ths sinus wall, is labeled in orange. This branch often arises from the ascending pharyngeal artery jugular division or possibly from petrosquamosal branch of the MMA. This is a common site of dural fistula formation. 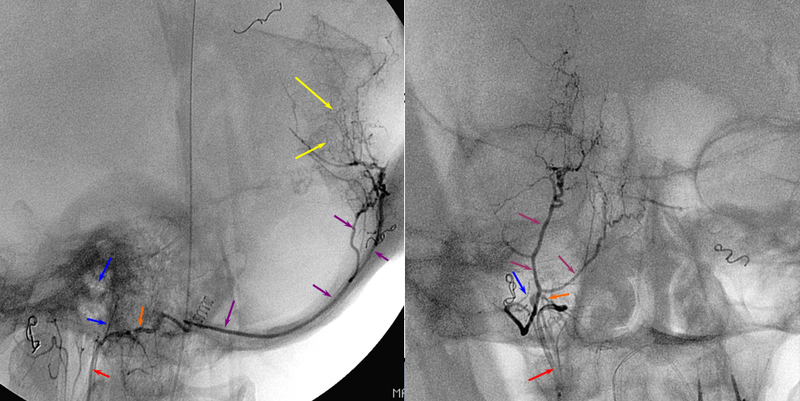 Native mask image on the right shows this branch following the course of the sigmoid sinus. 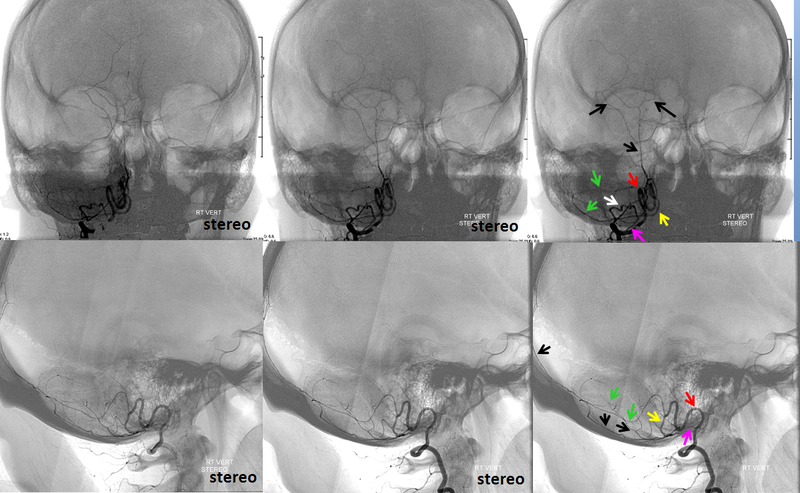 Stereo view (sit back about 4-6 feet, depending on severity of your myopia or hyperopia), demonstating a PICA origin of the falx cerebelli artery. More typically this branch arises from the vert. Stereo images of the same patient shown below demonstrate extent of this vessel which reaches the torcula. A branch to the lower aspect of hte falx cerebri, arising in this case from the posterior choroidal artery (stereo very helpful here), is labeled in orange. 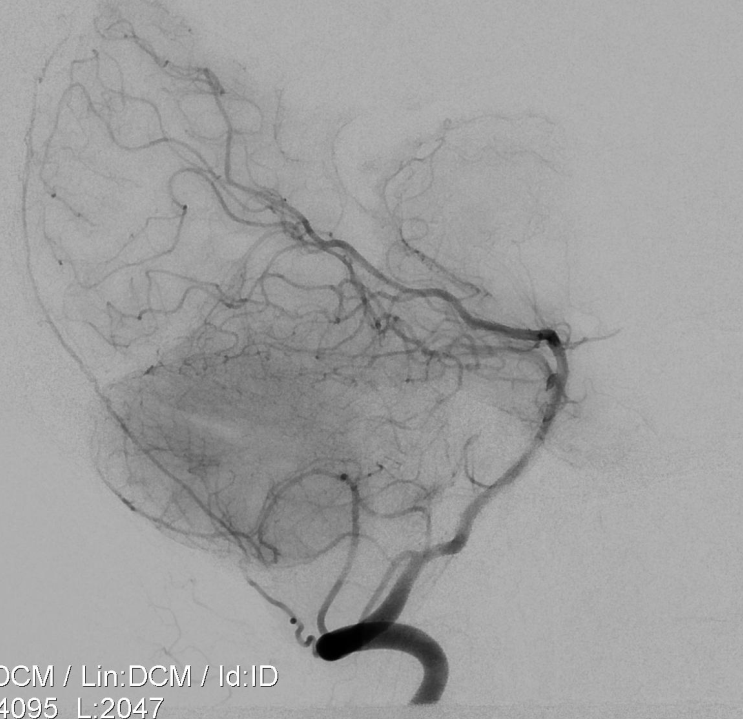 Posterior meningeal artery origin from jugular division of the ascending pharyngeal artery. 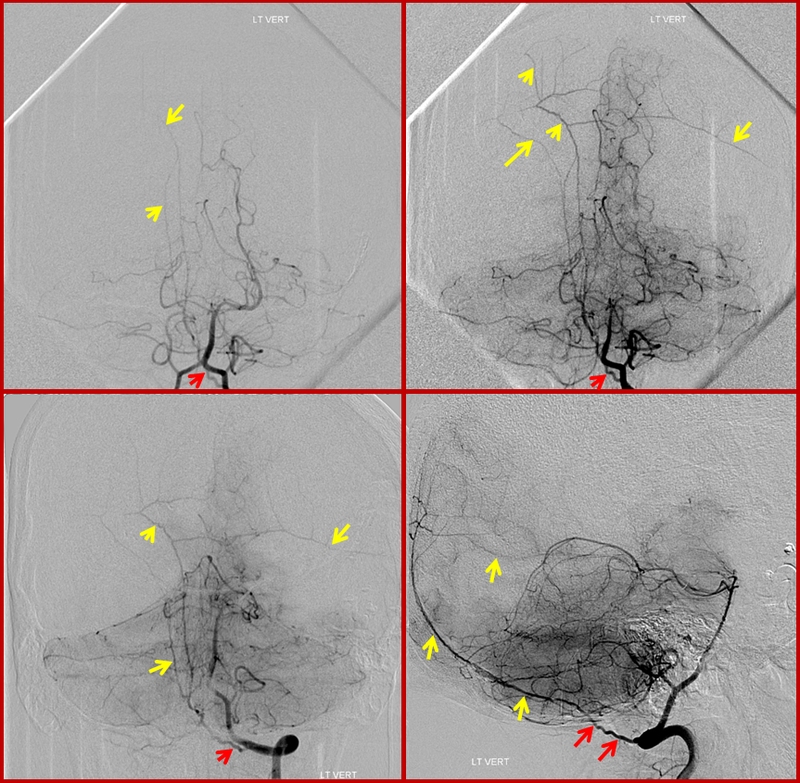 In a patient with en-plaque meningioma of the parieto-occipital region, an enlarged posterior meningeal artery coming off the jugular division of the neuromeningeal trunk of the ascending paryngeal artery participates in supply of the tumor. The tumor was embolized with particles and pedicle closed with pushable coils (contralateral parietal division MMA branch coil is visible as well) Inferior tympanic branch in a patient with parietooccipital meningioma. The inferior tympanic branch projects over the auditory canal, and follows the expected course of the aberrant carotid artery.